Homes built with block, brick, or stone foundations can eventually crack over time. Also, the mortar holding the materials together can weaken and become brittle. When this happens, moisture from the soil, and from melting snow, can easily get into the basement environment. This is an all too common problem that we have seen in a variety of homes. When this happens, it is also not uncommon to see the walls leaning into the home on account of all the hydrostatic pressure in the soil surrounding the structure's base. This pressure eventually proves to be too much for the wall, and it can start to bow. This problem can be taken care of with wall anchors and plates. 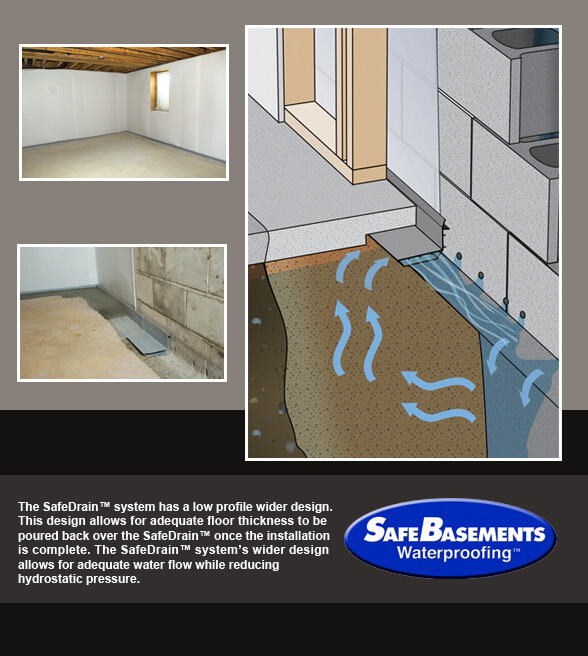 St. Louis Basement Pros can install special waterproofing products from SafeBasements™, including drains that will be able to channel water from the walls to a sump pump system. Once inside the sump, it will be pushed out and away from the home, leaving you with a dry, safe, and usable area.